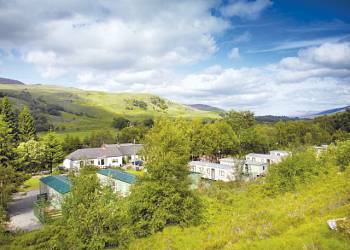 Surrounded by the majestic hills and lovely glens of the Loch Lomond and Trossachs National Park this family park offers a superb base for exploring Argyllshire Perthshire and The Highlands. Nestling in woodland just 50m from the River Dochart and only ½ mile from Loch Luib Glen Dochart boasts wonderful salmon and trout fishing+ together with abundant opportunities to enjoy some of Scotland's most spectacular scenery. This beautiful area bursts with superb attractions that will appeal to all ages and tastes. The famous Falls of Dochart the steam train from Crianlarich to Mallaig watersports at Lochearnhead horse riding Rob Roy's Cave and the mines at Tyndrum are all within just 15 miles. Further afield are various places to shop and within 2 hours' drive The Highlands. Glen-Dochart offers the following facilities. There is a shop with off licence and a launderette available for all dates on site. This is the heart of Scotland, a majestic landscape of hills and lochs, great forests and fertile lowlands, dotted with historic small towns and ancient villages.Amidst stunning scenery you can enjoy a fantastic range of activities from extreme sports to relaxing walks - the lovely woodland trails in Killiecrankie are a favourite with visitors taking caravan holidays in Perthshire and Kinross-shire. Mighty rivers and lochs lend themselves to world-class fishing and water sports, and nature lovers and bird watchers should head to Loch Leven, also the setting for the island castle where Mary Queen of Scots was imprisoned. 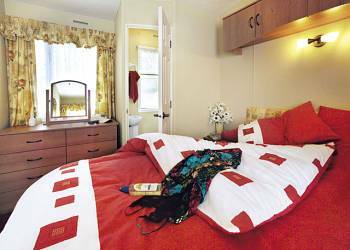 The accommodation is 5 star plus, it really is luxury and quality. 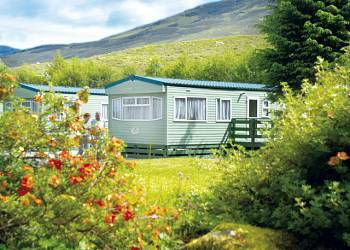 The park itself is well kept, and the staff and owners of the very were excellent - very helpful and friendly. The location is perfect, the welcome is wonderful and the accommodation was perfect. You can't improve on my holiday, it was wonderful and I will be going back as often as possible - thank you! 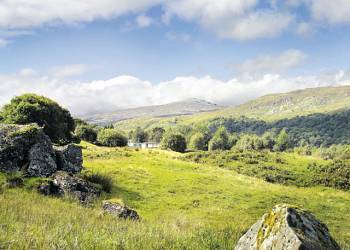 Great location for sight-seeing both Perthshire and the Trossachs. Accommodation was to a very high standard and clean. On arrival we were shown to our caravan and given a quick tour of the accommodation, which was a nice personal touch. Peace and quiet and a great spot for touring. An idyllic setting and a great central location for exploring the whole of Scotland - if you've got a car ! 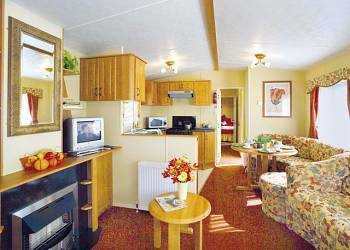 An excellent standard of accommodation and friendly staff and the park was ideally situated for day trips around the area. Amazing views and we can't wait to go back - one of the best holidays we've had! 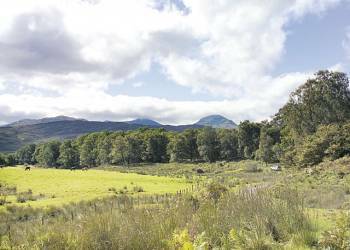 Brilliant park, ideally situated between Crianlarich & Killin. The welcome we received was second to none, we were shown to our caravan by the site manager, who had provided us with milk, tea, coffee & sugar. Will def be back again, ideal base for touring. If you want an away from it all holiday within easy reach of lots of places of interest Glen Dochart is the place to be. We were made very welcome and the accommodation was first class! An excellent, central park for touring the southern and central Highlands. We were made to feel so welcome and the caravan was great value for money. This holiday destination was absolutely perfect, secluded and extremely comfortable. You cannot improve it was perfection! We would not hesitate to recommend to others and have a return visit if at all possible in the future! Have you been to Glen-Dochart? Please submit your review so that others can benefit from your experience. Important note: Information provided here about Glen-Dochart is for guidance only.